Display certification for low blue light, flicker free quality and reduction of reflections. From the very young to the very old, most people on the planet can be described as either a user or an operator of some sort of computer or digital device. To protect the eyes and provide a comfortable work environment, manufacturers and distributors want to be certain that displays intended for use in permanent work stations or portable devices have been professionally tested and certified. We provide you the independent testing and certification necessary to demonstrate the safety and quality standards demanded on today's markets. Our experts can further advise you on topics relevant to promoting a more comfortable, more productive work space for your customers. Gain competitive advantage and demonstrate your corporate commitment to quality by ensuring product safety according to global standards. Benefit from over 25 years of our experience in testing of display devices to provide your customers’ products certified to reduce negative symptoms such as eye strain, headaches and blurred vision as well as back, shoulder or neck pain to positively impact their employee performance and company profits. Ensure compliance with both statutory and voluntary requirements to boost confidence in the safety and quality of your product. Gain a competitive edge with internationally-recognized independent quality marks. Let our global team of TÜV Rheinland experts provide you reliable, third-party testing and eye comfort certification to strengthen your product image and heighten marketability. As the leading eye comfort certification provider, we conduct laboratory testing and certification of displays according to the ISO 9241-307 standard to eliminate annoying reflections, safeguard image quality from different perspectives, facilitate adjustable blue light content and ensure displays are flicker free. We also provide you programs tailored to improve 3D display image quality. Our testing and certification services further include instructions on proper installation and usage as well as helpful hints related to workplace lighting, posture, break times and eye exercises to provide an increased level of comfort and reduce instances of debilitating conditions caused by eye fatigue. Eye comfort testing and certification services address the common concerns of blue light content, flicker and high quality imaging. 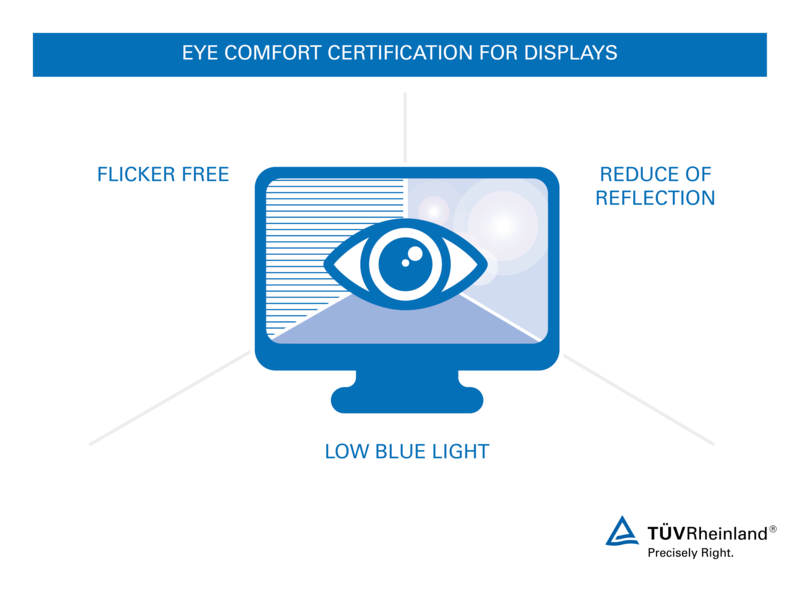 Certified displays have reduced blue light and are flicker free to protect eyes and preserve user vision and allow the user to change body position without compromising visual image quality. In addition to voluntary eye comfort certification, successful candidates can also be recognized through GS-, Ergo- and ISO 9241-307/308/309 mark distinction. Eye comfort certification verifies the quality of your products strengthens your company image and positively impacts your footing in demanding markets. As your trusted partner, our global network provides you unique access to our international experts and laboratories. Put our extensive experience in testing and certifying displays according to high quality standards to work for you!